During the 2012 presidential election, Latino voters were finally recognized as being decisive in shaping national politics. No doubt the 2016 presidential contest will once again provide a national spotlight for Latino political power. Despite the hype surrounding the power of the “Latino vote,” it is important to recognize that their electorate is composed of a diverse group of Latin Americans with varying levels of political engagement. Dominican Americans are the fastest-growing Latino group in the Northeast, yet they are a segment of the Latino electorate that has not historically received the same rates of engagement, voter outreach and information by political campaigns. To assess opportunities and obstacles to greater civic engagement, in partnership with Dominicanos USA, Latino Decisions implemented a series of focus groups, in-depth interviews, and an 800-respondent telephone survey of Dominican Americans in New York and Rhode Island. From previous studies we find that issues important to Latinos can be a source of political mobilization when discussed by candidates or community-based organizations. We asked about issues in two different ways: first by providing an open-ended question in which respondents could volunteer any issue they felt was important, and second through a series of specific questions about education, housing and healthcare issues. 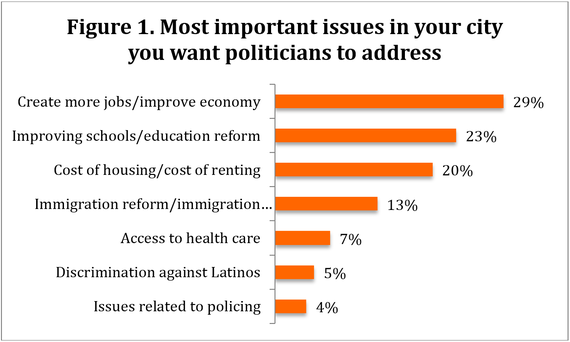 At the start of the survey, we asked respondents the following: “What are the most important issues facing the Dominican community here in your city that you think politicians should address?” and respondents could name any issue or topic they wanted and could name two different issues. Overall, the theme of jobs and the economy topped the list, with 20 percent naming that as the top issue, followed by education reform and improving schools at 23 percent, and housing affordability in third place, with 20 percent. Rounding out the top five issues were immigration reform (13 percent) and access to health care (7 percent). 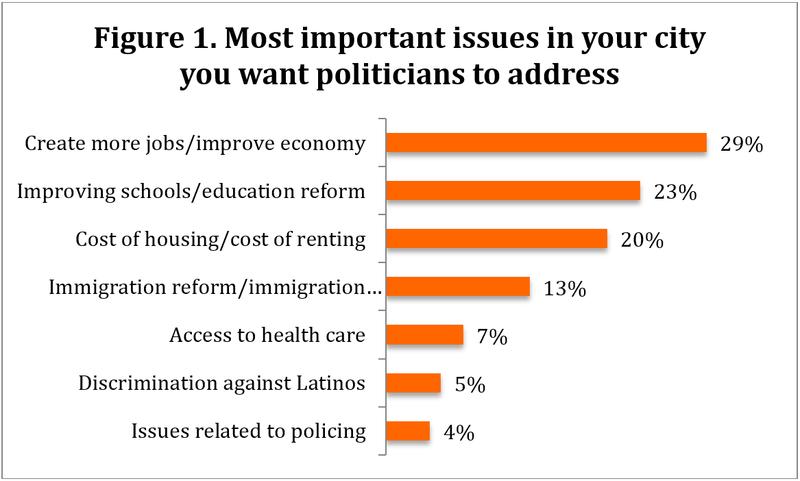 It is also important to note that 5 percent mentioned discrimination against Latinos and 4 percent mentioned police issues as their most important issue of concern (see Figure 1). Candidates and community-based organizations can draw out Dominican voters by highlighting the importance of politics in addressing the policy issues noted above. 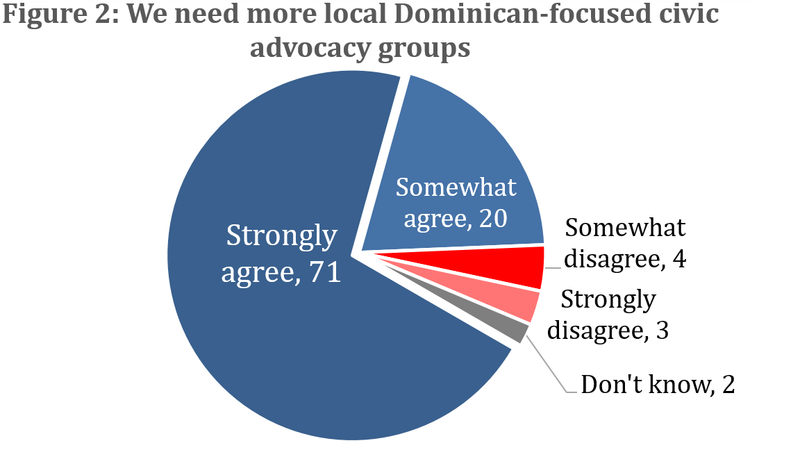 Equally significant are Dominican candidates and Dominican-focused community groups. While the number of Dominican voters has been growing rapidly, respondents showed a strong desire to see more Dominican elected officials and Dominican-serving community groups to reflect their growing numbers. Overall, 79 percent of registered voters said they would be more likely to vote if they had a chance to elect the first-ever Dominican American to Congress. This was matched by 78 percent of non-registered Dominicans who said they would be more likely to become registered if given an opportunity to see a Dominican elected to Congress. For non-registered, there was an even stronger desire to see local level representation, with 87 percent indicating they would be more likely to register to vote to elect more Dominican Americans to the city council or office of mayor, with which 74 percent of registered voters also agreed. Finally, there was a very strong sense that beyond candidates, there is a need for more Dominican-focused community organizations to inspire civic participation. 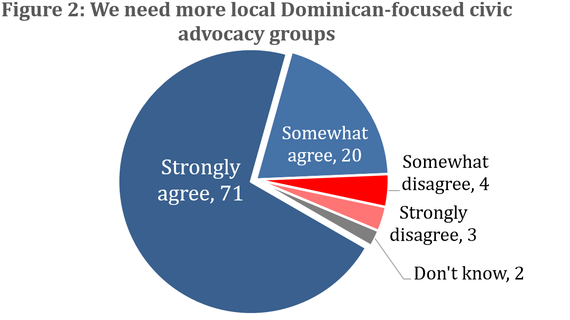 An overwhelming 91 percent of registered and 94 percent of non-registered Dominicans agreed with the statement “We need more local Dominican-focused civic advocacy groups that help raise the voice of Dominican Americans.” The intensity of this support is evident given that 71 percent of registered and 79 percent of non-registered saying they strongly agreed with this statement (see Figure 2). An important theme in the Dominican American community is binationalism and transnationalism, in which Dominican Americans continue to show great pride in their homeland and maintain strong ties to the Dominican Republic and at the same time embrace and engage the United States. What’s perhaps most interesting is that we can observe a pattern of higher levels of interest and engagement in politics in the U.S. among those with the higher levels of engagement with homeland issues. Those with higher levels of transnational engagement have higher levels of following politics in the U.S. by paying closer attention to politics and current events in the news, and are more likely to say they plan to vote in the next election. This survey represents one of the first studies of Dominican American political engagement. Its uniqueness lies in uncovering the barriers and motivators to further increase civic engagement among this growing segment of the Latino electorate. The survey revealed that one of the biggest barriers to participation is that respondents felt that they lacked sufficient information about candidates and the political process. This suggests that existing candidates and parties have not done a good job in targeting and mobilizing Dominican voters and explains why large numbers of Dominicans say they are eager to see Dominican candidates run for office and have Dominican-focused civic organizations involved in politics. At over 1.5 million, Dominicans are the fifth-largest ancestry group within the Latino population. Yet in the state of New York, Dominicans constitute the largest segment of the Latino population and are numerous in other states in the Northeast. This means that Dominicans are poised to be significant political players within and outside the Latino community. The degree to which this becomes a political reality will largely depend on the degree to which Dominican candidates and Dominican civic organizations take the lead in mobilizing this important segment of the Latino electorate in the Northeast. Latino Decisions fielded a survey of Dominican American in New York and Rhode Island to assess the most important issues in the community and what messages an themes might encourage Dominican Americans to increase the civic engagement in the U.S. The survey included 800 total respondents, for a margin of error of 4.9 percent. Calls were made between June 8 and 16, using bilingual live telephone interviews, allowing the respondents to take the survey in either English or Spanish, at their discretion. Respondents were contacted on a representative mix of cellphones and landlines, and the survey averaged 14 minutes in average length. Finally, the respondent pool is based on a sample of citizen adults and eligible voters and includes a mix of currently registered and unregistered voters. Samples were drawn from the Catalist Dominican model score database for New York and Rhode Island, and all respondents were screened and self-reported that they were adult citizens, eligible to vote and of Dominican ancestry or heritage. Overall, 53.5 percent of all subjects reached on the telephone met the criteria and were eligible to participate in the study. Adrian D. Pantoja, Ph.D., is senior analyst for Latino Decisions and a professor of politics at Pitzer College. Manny Matos is a board member and spokesperson for Dominicanos USA.